For a Southern state, Tennessee has a comparatively smaller number of butterfly species. What they lack in total numbers, they make up with enthusiasm. Butterfly gardens are promoted throughout the state. For example, people in the Chattanooga area can visit the Butterfly Pavillion at the Tennessee River Gardens & Nature Preserve. The Smoky Mountains in the east are great for butterfly enthusiasts, with close to one hundred documented species. The North American Butterfly Association (NABA) Middle Tennessee chapter can set any resident up with a plant, shrub and tree selection to build a very successful three season butterfly garden. They also participate three times each year in the NABA butterfly count. All interested persons are invited to join them and spend a few days of the year walking here and there counting the butterflies. Finally, in the west, the Memphis Zoo also hosts a butterfly garden and provides residents local butterfly garden growing tips. Butterfly identification usually begins with color, and the Tennessee butterflies guide provides a list of all the state’s butterflies arranged according to family, with color a major family component. One page is never enough to provide all the butterfly pictures. Please press the green butterflies button for additional pictures and information. Butterflies with white wings and yellow wings belong to a family called Pieridae. 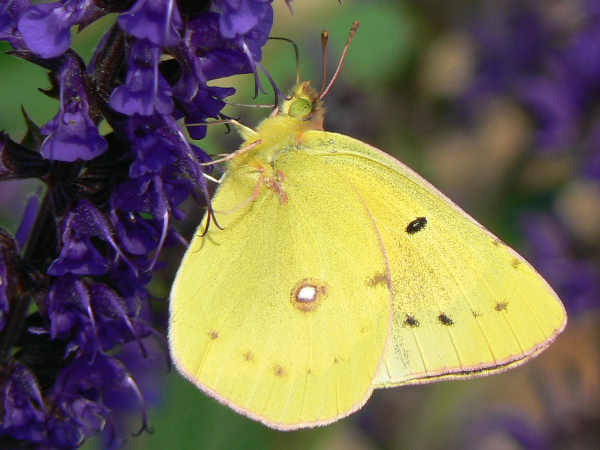 Most states have more of the yellow butterfly species and Tennessee is no exception. The picture shows a Clouded Sulpher butterfly. The list divides the Tennessee species into color categories. West Virginia Whites and Olympia Marbles have the most limited range. They are eastern species. 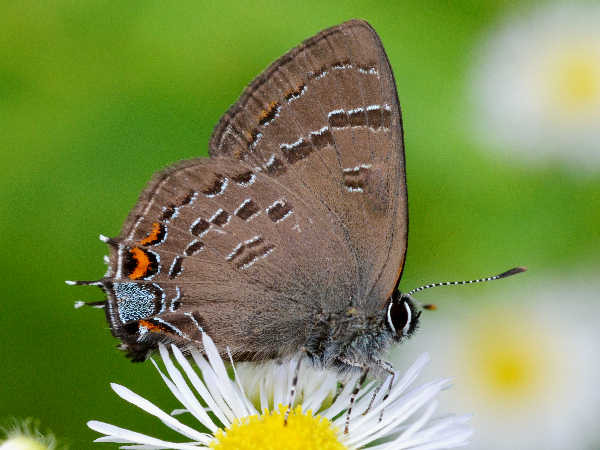 The list sure does show a high number of hairstreak butterflies in the state. Only the Red-banded and Gray have a state wide distribution. The picture shows a Banded Hairstreak. They are a fairly common eastern species. Harvesters are the most common copper butterflies in the state. A few western and central counties host the Bronze Copper. Eastern areas are hosts to the American Copper. Summer Azures and Eastern Tailed-blues are common all through Tennessee. The remainder of the species have very limited geographical ranges. 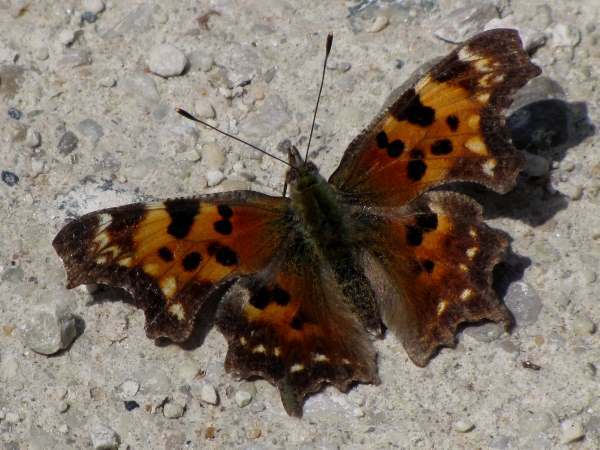 The picture shows an Eastern Comma butterfly. They, along with the Question Mark are the two most common Comma butterfly species in Tennessee. The state also has a large number of Fritillary species. All of them are very common in the eastern part of the state. 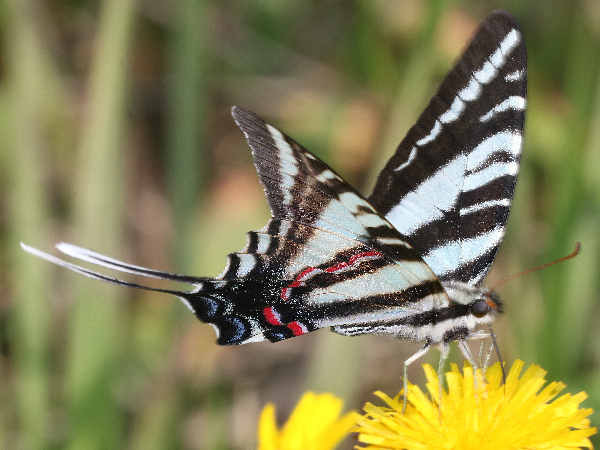 The Zebra Swallowtail is the state butterfly. 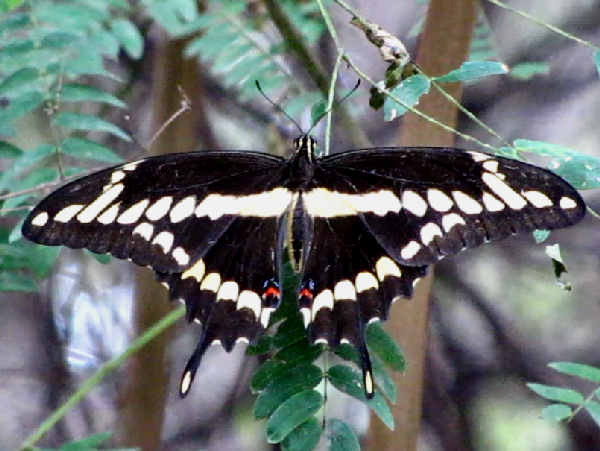 The picture shows another very common species, the Giant Swallowtail. The Applachian Swallowtail and the Palamedes have the smallest range. Otherwise, Tennessee swallowtail butterflies fly all over the state.